Written by Lucius “Luke” Lampton, MD and Karen Evers, longtime editors of the state’s respected monthly medical journal, Images in Mississippi Medicine: A Photographic History of Medicine in Mississippi provides an extraordinary and unrivaled account of the evolution of medicine in Mississippi from territorial times to today’s latest technology. 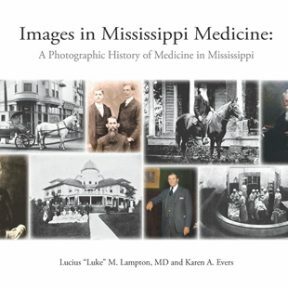 This magnificently illustrated book offers a unique array of rare photographs and historical images as well as compelling essays by Dr. Lampton which reveal the untold story of Mississippi’s medical history, a largely forgotten drama peppered with forgotten but brilliant medical heroes who helped shape the larger history of the state in both political and social terms. Over two decades in the making, this book will prove essential to anyone interested in medicine in the state.